penguin begets penguins: Did you vote for me? I am finally staring work tomorrow. Yahoo! I am feeling pretty healthy tonight finally. Yesterday was baaaad, today was just bad but I didn't get to rest because Ben was sick all night last night, Marcel is now sick & Evan was really clingy/grouchy/weird. Did I mention that my poor dad got the bug from us too & has been suffering since last night too? I am so sleepy & I have to get up quite early while I try to figure out how much time I actually need to get myself out the door on time for this new career thing. When I washed my face tonight, I couldn't figure out why I couldn't get all the mascara off of my face until it dawned on me that it was just the dark circles under my eyes. Oh my. So what am I doing? Sitting on the damn couch in my American flag pyjama pants, watching CNN. Election night is like my Super Bowl. My boring, confusing, nauseating Super Bowl. Every time they drag James Carville to discuss "Flahrida," I smile. Every time John King starts playing with his fancy map, I ooh & ahh. Wolf Blitzer thrills my soul. I am a weirdo. Anyway, Marcel still feels puny so he's in bed. Ben slept all day but is back in bed tonight - I doubt he's sleeping anytime soon but he's in bed & Evan is sleeping soundly for a little while longer so I'm celebrating Election Night all by my lonesome. Hush your face, it's not easy to get a candid picture of myself! 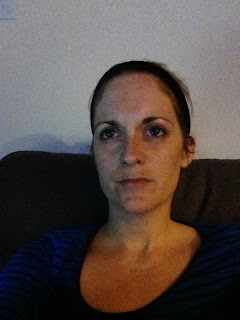 Please remember this is me post-face-scrubbing after battling gastro & taking care of sickies. This is the face I make every time they start on that overly detailed map that zooms in on every county in the country. Okay, I really am very sleepy so I'm logging off before I do anything silly like posting the ugly face picture I just texted to Marcel.